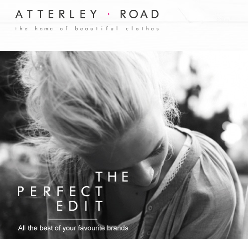 Atterley Road is a new, online fashion store. It is set to launch at the end of this month (July 2012) and the brand names include Jigsaw, Whistles, Hobbs, Crew Clothing, American Vintage and Petit Bateau. It sounds to me like a mid-market Net A Porter. The founder of Atterley Road is Katie Starmer-Smith, the former creative director at Jigsaw. To celebrate the website’s launch, everyone who signs up between now and the website’s launch at the end of July 2012 will receive a £25.00 giftcard, redeemable against an order of £50.00 or more. Atterley Road will also give you 100 “points” – equivalent to a £1 discount – for every friend you recommend. The site hasn’t launched yet so that’s all I know, really. I don’t even know why it’s called Atterley Road. But I ask you: who would say no to £25.00 off Petit Bateau? That stuff is so pretty, and it’s made to last: I have a couple of PB tops that are the best part of 10 years old now. You can sign up for your free £25.00 gift card here. I would like to order a sweater from your site and wondered if the £25 voucher is available.